This morning Europe woke up to stories of pensioners fainting in the streets of Greece, faced with limited cash flow to banks. They are a glimpse of a humanitarian crisis that the Greek people have faced for some time now – brought on by years of devastating cuts, austerity and unemployment imposed by unaccountable lenders. Not surprisingly, after the LuxLeaks revelations of an industrial-scale tax avoidance operation in Luxembourg, that country is at the heart of Walmart’s tax avoidance operations – where it has 22 shell companies, five of which were registered in 2015 alone. This blog is written by guest blogger Dr. Rory Hearne, Lecturer in Political and Economic Geography in National University Ireland, Maynooth. The government is misleading Europe about the reality of austerity and the debt crisis in Ireland so as to avoid admitting that they took the wrong approach with austerity, and their failure to get a meaningful debt deal. The truth is austerity is based on flawed economics and it hasn’t worked in either Ireland, Greece or for Europe and Ireland’s debt is unsustainable. Guest blogger Bodo Ellmers, from our partner organisation Eurodad, gives an overview of developments on debt workout mechanisms at the UN. Going into an IMF discussion: what is the guide for Ghana? Guest blogger Bernard Anaba writes about the IMF from the Ghana perspective. This article originally appeared in Ghana's Business and Financil Times and is reprinted here with permission from the author. In the early 2000s Ghana became financially distressed which sent the country into the HIPC initiative. But by 2006, the country seemed to have recovered well by reducing the national debt and sustained growth levels at rates not less than 5% of GDP annually. And by this time too, a kind of complacency kicked-in alongside the national vision to achieve a middle level income status. Thank you for acting for tax justice in 2014! In 2014, DDCI’s tax justice work focused on tax transparency. In the global tax system, transparency is vital to stop tax dodgers moving profits around the world to avoid tax, often from countries of the global south to lower tax regimes, such as Ireland. This will make you angry. 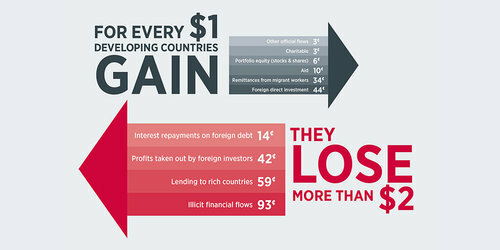 After six months crunching all the best data from international institutions, here’s what we found: for every dollar developing countries have earned since 2008, they have lost $2.07. In fact, lost resources have averaged over 10% of their Gross Domestic Product (GDP). We’re not talking about all flows of money out of developing countries, just the lost resources: money that should have been invested to support their development, but instead was drained out. Twice as much is leaking – or rather flooding – out than the combined inflows of aid, investment, charitable donations and migrant remittances.